Have you ever wondered how tab bar controllers and navigation controllers do their work? Even though it may seem as if UITabBarController and UINavigationController are magical classes, they are nothing more than UIViewController subclasses. What have these classes in common? Both classes allow you to insert custom content in the form of one or more view controllers. A navigation controller, for example, manages a stack of view controllers. You can push and pop view controllers onto and from a navigation stack. The same is true for a tab bar controller. It manages an ordered list of view controllers accessible through a tab bar at the bottom. Both UINavigationController and UITabBarController are container view controllers. What does that mean? 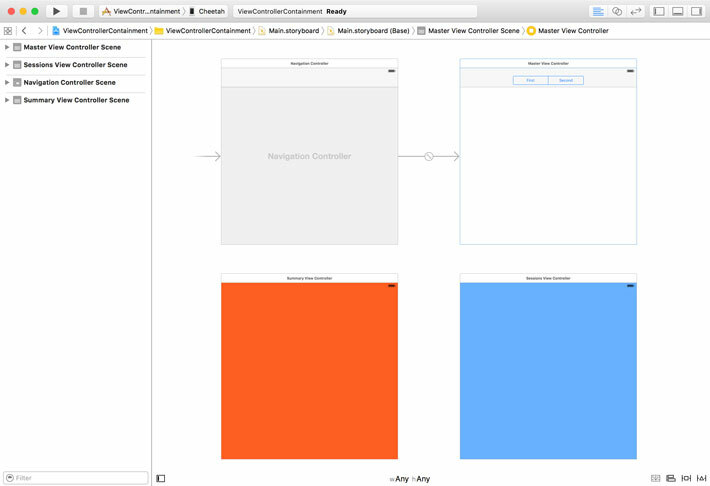 A container view controller manages a view just like any other UIViewController subclass. In addition to managing a view, a container view controller also manages one or more child view controllers. It acts as the parent view controller of one or more child view controllers. The parent view controller is responsible for setting the size and position of the view of each child view controller. The view of the child view controller becomes part of the parent view controller's view hierarchy. That said, the child view controller continues to be responsible for its own view hierarchy and that is what gives container view controllers their power. A navigation controller is highly reusable thanks to the container view controller architecture. It knows how to manages a stack of view controllers and it doesn't care what the child view controllers do. The same is true for tab bar controllers. A tab bar controller is aware of its child view controllers, but it doesn't know or care about their type or function. All it knows is how to manage them and navigate between them. A key advantage of container view controllers is reusability. As I mentioned earlier, UIKit includes a number of UIViewController subclasses that are container view controllers, such as UINavigationController, UITabBarController, and UISplitViewController. Each of these classes implements a navigation paradigm that is commonly found in iOS applications. A UISplitViewController instance, for example, presents a master view controller on the left and a detail view controller on the right. If the user taps an item in the master view controller, the item's details are shown in the detail view controller. 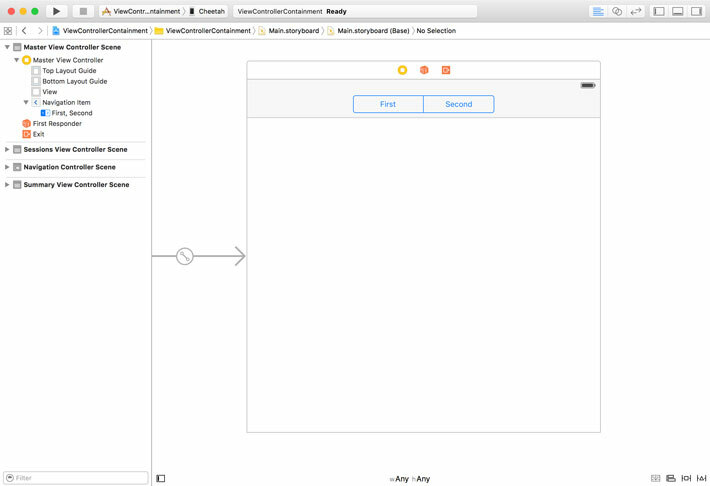 The master and detail view controllers are both child view controllers of the UISplitViewController instance. 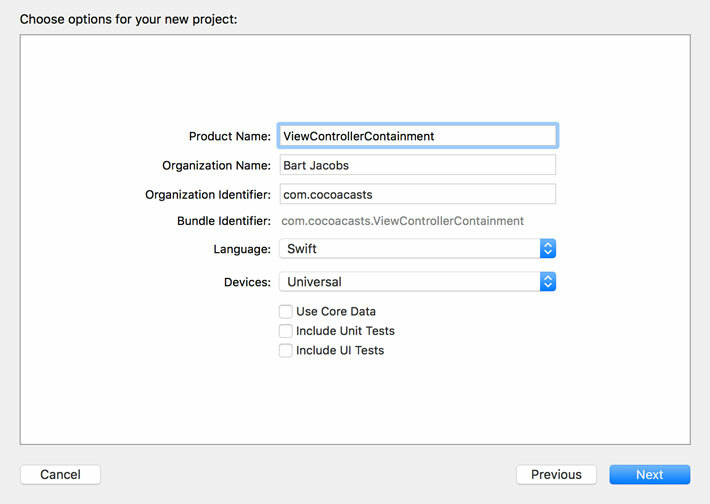 View controller containment makes it much easier to keep view controllers lean. Complex user interfaces no longer need to be managed by a single view controller. By using a container view controller, a user interface can be split up into logical or functional components, each managed by a view controller. This also makes it easy to deconstruct a user interface and reuse components in various parts of a project. It is easy or tempting to cram seemingly related functionality into a single view controller, but this often leads to UIViewController subclasses that span hundreds or thousands of lines. And that is not what you want. In this tutorial, I would like to show you how view controller containment can be used by creating a simple application that demonstrates the benefits of the pattern. You learn about the relationship of a container view controller and its children, and you also become familiar with the containment view controller API. 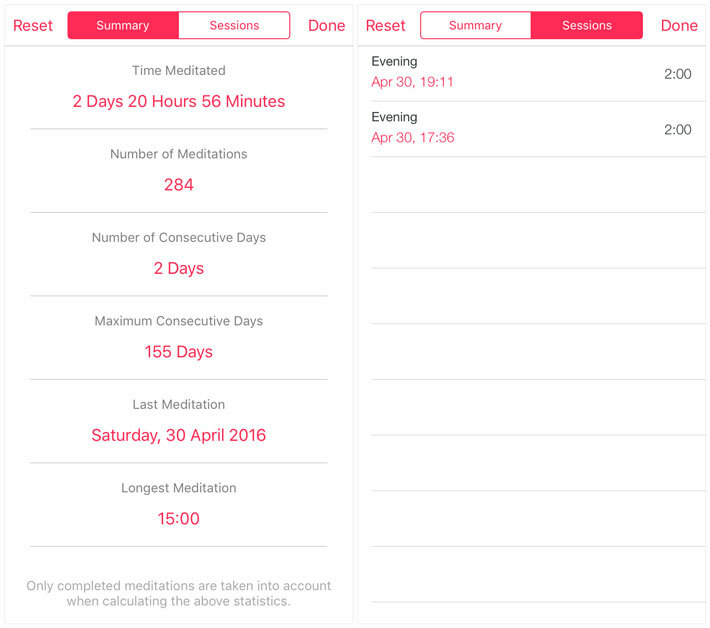 In Samsara, users can view their sessions in the statistics view. This view is managed by one view controller, a container view controller. At the top, the user can switch between a summary and a detailed list of each session. Each section is managed by a separate view controller, a child view controller of the container view controller. In this tutorial, we implement a similar user interface. The example we are about to create is pretty simple. 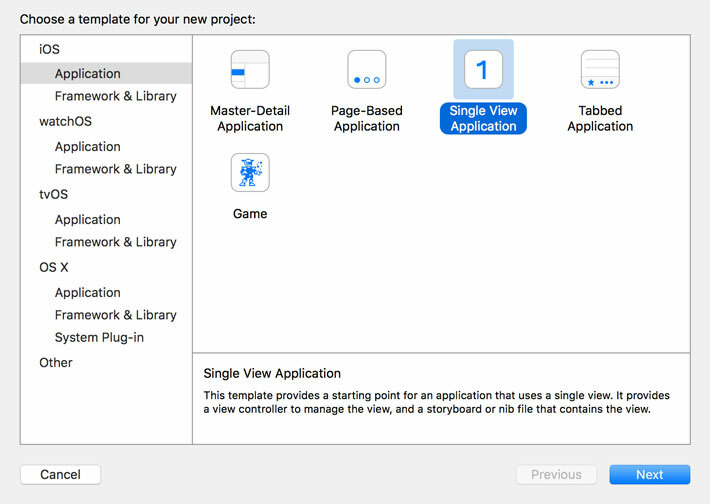 Open Xcode and create a new project based on the Single View Application template. Name the project ViewControllerContainment and set Devices to Universal. Start by renaming ViewController.swift to MasterViewController.swift. Open MasterViewController.swift and change the name of the class from ViewController to MasterViewController. This is what the contents of MasterViewController.swift should look like. 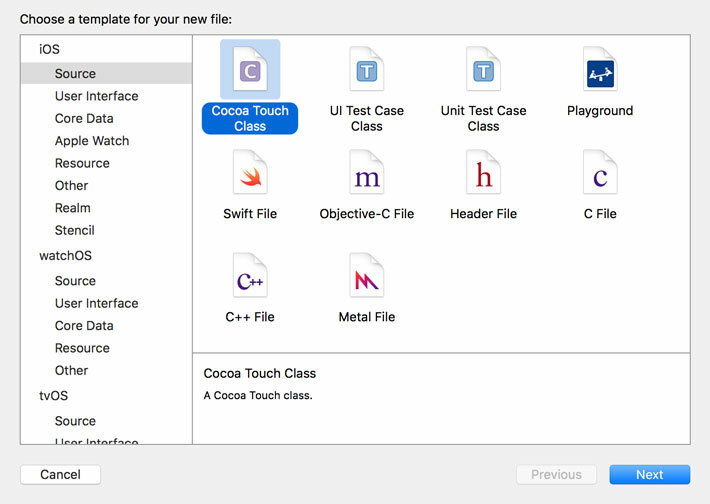 Create two UIViewController subclasses, SummaryViewController and SessionsViewController, using the Cocoa Touch Class template. These view controller classes will serve as the child view controllers of the container view controller. Open Main.storyboard and select the view controller of the scene that is already present. Open the Identity Inspector on the right and set Class to MasterViewController in the Custom Class section. With the view controller selected, choose Embed In > Navigation Controller from the Editor menu. This adds a navigation controller to the storyboard with the master view controller as its root view controller. To switch between the child view controllers, we use a segmented control. Open the Object Library on the right and add a segmented control to the navigation bar of the master view controller. Open MasterViewController.swift and create an outlet for the segmented control. In Main.storyboard, connect the outlet with the segmented control. We are almost done with the user interface. 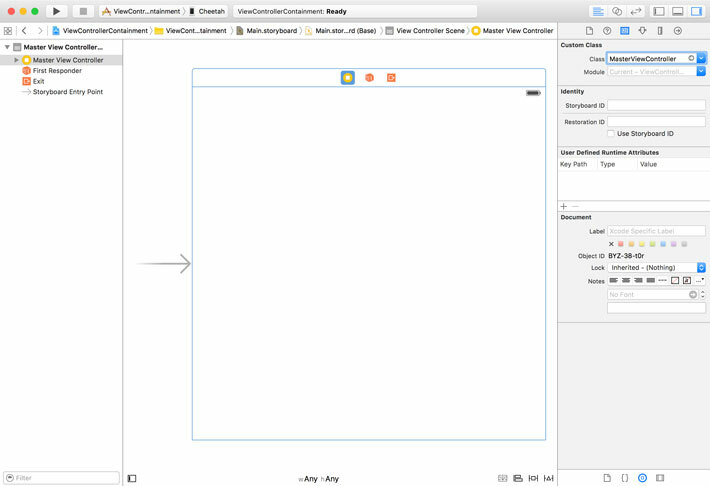 Add two view controllers from the Object Library to the storyboard. In the Identity Inspector, set the class of the view controllers to SummaryViewController and SessionsViewController respectively. 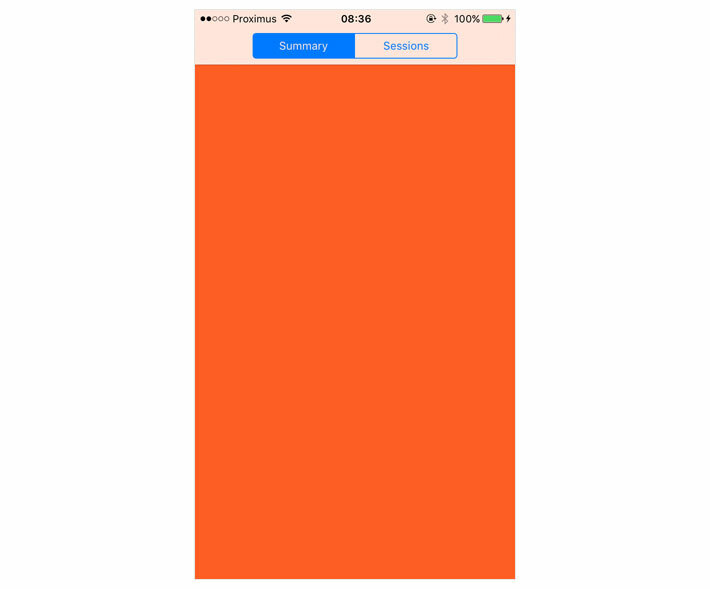 Select the summary view controller and set the background color of its view to orange. Open the Identity Inspector and set Storyboard ID to SummaryViewController. This will allow us to load the view controller from the storyboard in code. Select the sessions view controller and set the background color of its view to blue. 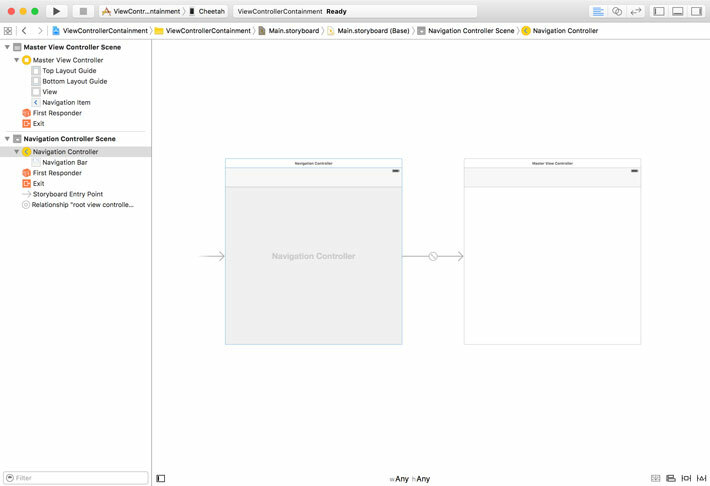 Open the Identity Inspector and set Storyboard ID to SessionsViewController. This is what the storyboard should look like when you are finished. Build and run the application in the simulator or on a physical device to make sure everything is wired up correctly. Open MasterViewController.swift and update the viewDidLoad() method as shown below. The setupView() method is nothing more than a helper method to keep the viewDidLoad() method short and uncluttered. In setupView(), we invoke another helper method, setupSegmentedControl(). In this method, we add two segments to the segmented control and add the master view controller as a target to the segmented control. We also set the selectedSegmentIndex property to 0 to select the first segment. The implementation of selectionDidChange(_:) is pretty simple. We invoke another helper method, updateView(), which we will implement later in this tutorial. There are several ways we can instantiate the child view controllers. We can add lazy properties to the MasterViewController class or we can set the child view controllers up when the master view controller is initialized. I prefer to use lazy properties because it instantiates the child view controllers when they are needed. If the user never taps the Sessions segment of the segmented control, then there is no need to instantiate an instance of the SessionsViewController class. Lazy properties let us do this. Note that we force cast the result of instantiateViewController(withIdentifier:) to the correct type because instantiateViewController(withIdentifier:) returns an instance of UIViewController. What is more interesting is the implementation of add(asChildViewController:). In this method, the magic happens. The implementation shows the steps that are required to add a child view controller to a container view controller. First, we add the child view controller to the container view controller by invoking addChildViewController(_:) on the container view controller, passing in the child view controller as an argument. By invoking this method, the child view controller automatically receives a message of willMove(toParentViewController:) with the container view controller as the only argument. Second, we add the view of the child view controller to the view of the container view controller. Remember that the container view controller is responsible for the size and position of the child view controller's view. The view hierarchy of the child view controller continues to be the responsibility of the child view controller, though. Last but not least, when the child view controller is added to the container view controller and the child view controller's view is ready to be displayed, the container view controller notifies the child view controller by sending it a message of didMove(toParentViewController:), passing itself as the only argument. To remove a child view controller from a container view controller, we need to take a few steps. Take a look at the implementation of the remove(asChildViewController:) method below. First, we notify the child view controller that it is about to be removed from the container view controller by sending it a message of willMove(toParentViewController:), passing in the container view controller as an argument. Second, the child view controller's view is removed from the view hierarchy of the container view controller. Third, the child view controller is notified that it is removed from the container view controller by sending it a message of removeFromParentViewController(). Note that we pass nil as the argument of willMove(toParentViewController:). This indicates that the child view controller is about to be removed from the container view controller. The last piece of the puzzle involves updating the user interface when the user taps a segment of the segmented control. We update the view of the container view controller in the updateView() method. In this method, we add or remove the child view controllers, depending on the segment that is currently selected. Because the master view controller keeps a reference to the summary view controller and sessions view controller, these view controllers are not deallocated when they are removed from the container view controller. In other words, they are only instantiated once and, more importantly, they keep their state even if they are not visible. This is similar to how the UITabBarController class behaves. The main difference with a tab bar controller is that the tab bar controller manages an array of view controllers, which makes the UITabBarController class very reusable. We could apply a similar strategy for the MasterViewController class by defining a viewControllers property of type [UIViewController] for storing a reference to each of the child view controllers. We also need to invoke updateView() at the end of the setupView() method as shown below. Build and run the application to see if everything is working as expected. Why Is View Controller Containment Important? You may be wondering what we gain by using a container view controller. Why can't we add the child view controller's view to any view controller? Why do we need to invoke addChildViewController(_:), removeFromParentViewController(), willMove(toParentViewController:), and didMove(toParentViewController:). There is a very good reason for doing so. Open SummaryViewController.swift and add the following implementations for viewWillAppear(_:) and viewWillDisappear(_:). Open SessionsViewController.swift and add the following implementations for viewWillAppear(_:) and viewWillDisappear(_:). Run the application in the simulator and inspect the console. Do you see the print statement we added to the SummaryViewController class? Tap the Sessions segment of the segmented control and inspect the output in the console. Great. In MasterViewController.swift, update the implementation of add(asChildViewController:) as shown below. Note that we removed every method call related to view controller containment. We only add the child view controller's view to the view of the master view controller. Run the application one more time and inspect the logs. It appears that the summary view controller is no longer notified when its view is about to appear even though the application looks and feels identical. This shows the importance of view controller containment. By adding a view controller as a child view controller to a container view controller, the latter forwards messages related to appearance to its children. This is a key aspect of view controller containment. If the view of a child view controller is added to another view controller's view without using the view controller containment APIs, the child view controller isn't notified about events related to appearance. This means that messages such as viewDidAppear() and viewDidDisappear() are never sent to the child view controller, which could cripple the view controller. Even though UINavigationController, UITabBarController, and UISplitViewController are container view controllers, Apple cheated a little bit when it added support for these classes to UIKit. Ideally, a child view controller should not be aware of its container view controller. But have you noticed that the UIViewController class has getters for each of these container view controllers? That is what enables a child view controller in a navigation stack to push another view controller onto or to pop itself from the navigation stack. To promote reusability, make sure the child view controllers know as little as possible about the container view controller that manages them. You can use protocols and delegation to facilitate the communication between a container view controller and its children. Remember that a container view controller is responsible for sizing and positioning the view of the child view controller it manages. The child view controller is the only view controller in charge of managing the views of its view hierarchy. In other words, the container view controller should only access the child view controller's view. It has no business interacting with other views in the child view controller's view hierarchy. Most iOS applications make use of view controller containment through UINavigationController, UITabBarController, and UISplitViewController. This tutorial has shown you how you can leverage this pattern in your own applications. The result is improved reusability and leaner view controllers.